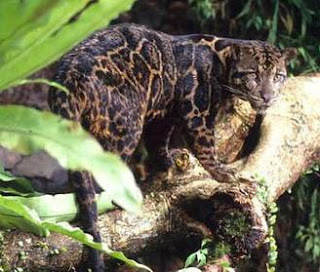 Neofelis diardi, the "new" clouded leopard species (actually first described in 1823, but later sunk into synonymy until recently resurrected) that has become something of a poster child for arguments on the worth of recent vertebrate species splits. Photo from Tet Zoo. Sangster, G. (in press) Increasing numbers of bird species result from taxonomic progress, not taxonomic inflation. Proceedings of the Royal Society of London Series B. Despite the widespread (and, I should note, entirely valid) complaints about the decline of taxonomy as a field of research, a person unfamiliar with the dynamics of the field might possibly be forgiven if, on a cursory glance, they saw it as stronger than ever. The number of new taxa, particularly species, being described every day has not appreciably slowed down - indeed, new species are probably debuting faster than ever. In many cases, study of a "species" once believed widespread has lead to the recognition of multiple species, each occupying a different part of the originally-recognised taxon's "range". This latter pattern is particularly noticeable in studies on vertebrates. Often, the new "species" were previously recognised as "subspecies" before their promotion. This has led to the accusation that such cases are examples of taxonomic inflation. 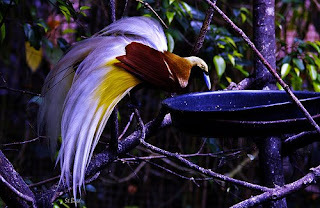 Lesser bird of paradise, Paradisaea minor. Birds of paradise have become one of the prime examples of conflict between the Biological and Phylogenetic Species Concepts. Most authors claiming to follow the BSC have recognised about forty species of bird of paradise (and that total is possibly oversplit, considering the high interfertility of the recognised species), but applications of the PSC to the family have suggested more than ninety species. Photo by stboed. For those of you unfamiliar with the term, the term "taxonomic inflation" refers to situations where names, but not the content, of taxa change as a result of their elevation in rank. When the term is used, it usually carries the disparaging implication that this is change simply for the sake of change without any underlying gain in information, and hence unnecessary at best and a misleading waste of everyone's time at worst*. Taxonomic inflation has also been cited as a problem with the use of the Phylogenetic Species Concept (PSC) rather than the Biological Species Concept (BSC) (see here for an earlier post of mine on the subject). Many authors have complained that the rise in recognised species is bad news for conservation, as it increases the number of required conservation targets. *Personally, I (and others before me) would argue that taxonomic inflation is an inevitable side-effect of our current use of a rank-based classification. As I complained last week, an unfortunate side-effect of the pinning of our ranking system on certain primary ranks leads to the belief (whether concious or subconcious) that those ranks should be used for the most "significant" taxa. Now, imagine that I'm a researcher spending five years working on a particular family of organisms. As a result of my research, I find that my "family" of interest renders another "family" paraphyletic. Assuming that I prefer a classification recognising all-monophyletic taxa, I have two options - either I can subsume my "family" of interest into the other family, or I can divide up the other "family" in order to maintain the distinctiveness of my research family. It all depends on my perception of the relative significance of the taxa - and what do you think that might be, considering into what I've been investing the last five years of my life? Variation in appearance between different populations of giraffe, Giraffa spp. Usually recognised as a single species, G. camelopardalis, recent authors have suggested giraffes should be divided between a number of species. Image from The Barcode Blog. The new paper by Sangster responds to the claim that the increase in recognised vertebrate species is due solely to the increased popularity of the PSC, and does not reflect any net increase in our taxonomic understanding (invertebrate taxonomy has been less affected by this debate, because invertebrate systematists have, for the most part, been less inclined to recognise "subspecies" [with the notable exception of lepidopterists]). According to Sangster, if this claim is true, it leads to four predictions: (1) the increase in recognised species would have not begun until the introduction of the PSC in the early 1980s*; (2) most taxonomic changes would be based on reinterpretations of old data rather than on collection of new data; (3) most taxonomic splits would be based on specifically PSC-related criteria such as diagnosability and reciprocal monophyly to each other and other taxa, as opposed to less specifically PSC-related criteria such as degree of difference ("too different" to be the same species, or "too similar" to be different species), differences in adaptive zone (e.g. lowland vs montane taxa) or reproductive isolation; and (4) new taxonomic splits would be biased towards members of charismatic groups (in which there may be more of a vested interest in raising their conservation profile). To test these predictions, Sangster surveyed taxonomic proposals affecting taxon rank published in seven major ornithological journals (such as The Auk and Ibis) between 1950 and 2007 - whether proposals recommended a split (subspecies becoming species) or lump (species becoming subspecies), and what were the criteria cited as support for the proposal. *The date is inexact because a number of variants on the PSC were proposed by different authors. The results of Sangster's survey showed that the increase in the percentage of taxonomic proposals recommending splits rather than lumps (shown in the graph above from the paper) had been continuous over the time period surveyed, and the rate of increase had not significantly changed in the 1980s (indeed, there had been a slight downturn in the 2000s, though probably not a significant one). 76.4% of taxonomic proposals over the period covered had been supported by new data rather than based on reinterpretation of old data, and proposals for splits were significantly more likely to be based on new data than proposals for lumps (84.6% vs 64.2%). Prior to the introduction of the PSC, 71.7% of proposed splits were based on new data - post-PSC, 93.9% of them were. Only 10.3% of proposed splits overall were based solely on reinterpretation of old data using PSC-related criteria. The most common criterion for a proposal was diagnosability, followed by reproductive isolation. The least commonly used criteria related to reciprocal monophyly. All criteria were more likely to lead to splits than lumps, though "degree of difference" had the smallest difference in propensity. Proposals based only on PSC-related criteria were more likely to lead to a split than those based only on non-PSC criteria, with the latter more likely to propose a lump than a split. There was no correlation between the increase of species in a family and the charisma of that family, but there was a correlation between the number of splits and the number of polytypic species (i.e. species divided into subspecies) in that family. The two storm petrel species breeding on the Azores, of which Oceanodroma monteiroi was only described last year in Bolton et al. (2008), from which comes this figure. Though very similar, the two species breed at different times of the year. Sangster concludes that the accusation that recent increases in species number are based solely on reinterpretation of old data is grossly unfounded. Proposed changes aren't taxonomic "inflation", they're taxonomic "progress". However, as much as I personally like his conclusion, it must be admitted that Sangster is potentially setting up a strawman here. Taxonomic research does not exist in a vacuum, and an author is not very likely to go about revising the taxonomy of a group unless they are working on that group already. The increase in the proportion of taxonomic changes supported by new data might indeed reflect changes in researcher practice - or it may reflect the journals becoming more discerning about what manuscripts they will accept for publication (still, for the reader it may not really matter whether the increased rigour is being driven by the researcher or the publisher). On the other hand, Sangster brings up the very important point that many of these "new" species aren't really new at all. During the early 1900s, vertebrate taxonomy went through a period of significant lumping. Sangster cites the point that while Sharpe recognised 18,939 species of bird in 1909, Mayr & Amadon recognised only 8590 in 1951 - less than half Sharpe's total. The justification for this lumping was often unclear (they were in a time period when a researcher's authority was generally taken for granted, rather than their being required to show their working), and many current taxonomists feel that in many cases the lumping went too far (for a concrete example, see Darren Naish's post from a few years back on babirusas). Many proposed splits are arguably correcting the excesses of the past. Finally, on a personal level, I wouldn't particularly care even if the species increase was based on a change in species concept, because as I've explained before (see the first post linked to at the top of this one), I'm a much greater fan of the PSC than of the impractical-to-test, everyone-says-they-follow-it-but-pretty-much-no-one-actually-does mess that is the Biological Species Concept. The conservation and PR argument cited above - that the PSC somehow leads to there being "too many" species - completely fails to impress me, because I don't think that scientific investigation should be directly influenced by political concerns. Once you have the information, then you can work out what to do about it, but changing your working information to what you want it to be first is just not on. Ah, lumpers and splitters, species concepts, the failure of the Linnaean hierarchy, and taxonomic inflation. All some of my favorite topics. I only really know these in the context of entomology, so I wasn't really aware there was such a problem in vertebrate taxa as well. I figured the smaller overall number of species would make it that much easier. Is anyone proposing to split Homo sapiens? Why not? I've always wondered why conservation wasn't at the Genus level. Speciation is so chaotic and mobile that it seems like a futile target. Kai, this sort of argument is actually more of a problem with vertebrate taxonomy, because (a) charismatic vertebrates have been revised to death more than inverts, and (b) as I mentioned in the post, most invert taxonomists haven't bothered with recognising "subspecies" in the first place - if it's distinct, it's a species. Larry, the last researcher I'm aware of who divided living humans into separate species was Louis Agassiz. The level of gene flow between human populations is probably much greater than between isolated vertebrate populations (at least these days). That said, the major issue at play here is probably a matter of politics as much as science. I think it would be unwise to divide humans into separate "species" because people would insist on reading more into that statement than is really there. This is an underlying handicap in any study of human variation, whatever the terminology you might choose to use. Steve: certainly as the number of recognised species increases, it becomes increasingly difficult (if not impossible) to conserve them all. There is a great need for a method to prioritise conservation targets (such as the EDGE system). I think the period of "lumping," at least with large mammals, lasted a bit beyond the 1950s. The nature guides of my childhood (1950s) had the American red fox and wapiti as different species (Vulpes fulva and Cervus canadensis) from their Palearctic cousins, but I have noticed that more recent sources lump them with Vulpes vulpes and ... is it C. elaphus? On species concepts and Homo sap: I have seen at least one paper (on some bunch of South-East Asian mammals, I forget which) which explicitly adopted a numerical measure of specieshood: above a certain percentage of nucleotide differences and two populations count as separate species. (Bizarre, it seems to me, if you like either the "biological" or the "phylogenetic" species concept: it seemed to me to be numerical pheneticism run wild, but it has obvious practical attractions....) And my understanding is that the various human "races" are actually LESS different from each other, on this sort of measure, than typically recognized SUBspecies of other mammalian species. The 'charisma' survey was by far the weakest part of Sangster's paper, I have to admit. I suspect that the scores for 'familiarity', etc. were probably Sangster's own estimates rather than being based on any actual survey. I would have also liked to see a list of the actual families scored for charisma - for practical reasons, Sangster limited the comparison to speciose families, but more speciose families, of course, also tend to be less charismatic in general. In response to Allen's comment as well, I'd be very interested to know if Sangster's results hold for mammals as well as birds, or whether mammalogists have different biases (or lacks thereof) from ornithologists. Hey, Old Taxo! My Genus is Better than Yours!